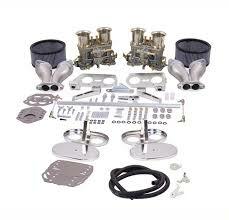 The best bolt on single performance carb kit for your 1600cc up to 1914cc Type 1 VW Motor. Kit includes carburetor with electric choke, heat risser tubes, aluminum center section manifold,gauze air cleaner, and all necessary hardware. Genuine Redline Weber Dual 40mm IDF carburetor kit for VW feature steel hex bar linkage with steel ball end, heim rod ends, dual port offset aluminum intake manifolds, steel linkage that won't flex, chrome air filter with gauze washable elements, coil relocation mount, brass fuel tee. Fits all dual port upright VW bug and beetle 1600cc and larger. Genuine Redline Weber Dual 44mm IDF carburetor kit for VW feature steel hex bar linkage with steel ball end, heim rod ends, dual port offset aluminum intake manifolds, steel linkage that won't flex, chrome air filter with gauze washable elements, coil relocation mount, brass fuel tee. 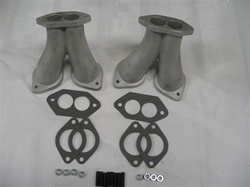 Fits all dual port upright VW bug and beetle 1700cc and larger. 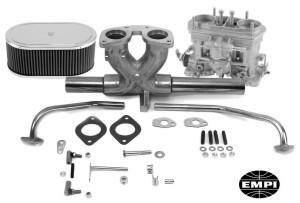 The best bolt on Dual 34 ICT's performance carb kit for your Type 2 or Type 4 VW Motor. 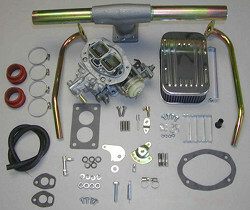 Kit includes carburetor with electric choke, heat risser tubes, aluminum center section manifold, gauze air cleaner, and all necessary hardware.